Diabetic Devan Crawford, seven, was on the verge of a hypo – a seizure caused by low blood sugar – when Bruno sensed that she was in trouble. She said: “Devan is a type one diabetic and has to inject insulin twice a day.Bruno is very protective of her. He saved her life because he sensed she was about to hypo. She had just been released from hospital and had been really ill."
Karen, 30, from Glenrothes, Fife, spoke out to highlight the gentler side of rottweilers as controversy rages over the breeding of a new “superdog” in Scotland. 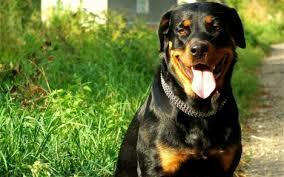 The presweiler is a cross between a rottweiler and a rare Presa Canario. Its breeders came under attack from watchdogs and charities. But Karen, who has had pure-bred Bruno since he was a pup and who owns four-year-old bulldog Bliss, said: “I think it is wonderful what they have done.They have created a beautiful breed of dog and there is no reason why they can’t get it recognised as a proper breed." Karen also revealed her mum had at first been furious when she decided to get a rottweiler, saying she did not want one near her grandchildren. She added: “That was three years ago and now they are best pals. She thinks the world of Bruno and her opinion of rottweilers has totally changed.